Why dress boring if you have style and prefer fashion looks. A fancy style french cuff dress shirt can take your ordinary suit and bring it to places you didn't think would exist. 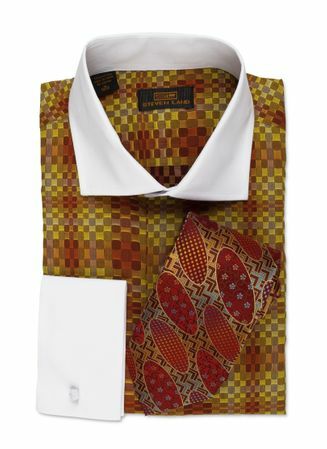 This rust pattern color dress shirt is made by Steven Land and features a white color spread collar with and matching french cuffs that have the same trim as well. This kind of look is a real eye catcher. It can give your style that modern look without even trying. Fabric is pure Cotton.